The Freight Transport Association Ireland (FTAI) annual Transport Manager Seminar takes place at the Johnston Estate Hotel on the 5th of March next. The seminar will include a keynote session from the Minister of State for EU Affairs, Helen McEntee, and topics to be covered at the event include skills shortages, apprenticeships, alternative fuels, decarbonising the freight sector and the impact of Brexit on Ireland-UK trade. 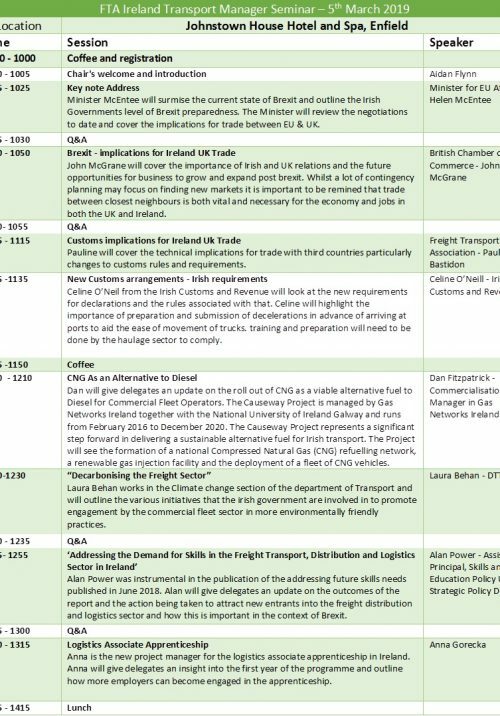 The impressive line-up includes speakers from FTA, the Department of Jobs, Enterprise and Innovation, the Climate Change Unit of the Department of Transport, Tourism and Sport, the Logistics Associate Apprenticeship and the Health & Safety Authority. This year’s Seminar is sponsored by Bridgestone Tyres, Brigade, Enprova, the Harris Group and the Logistics Associate Apprenticeship with Fleet Transport as media partners.